"I enjoyed this salad at a well-known restaurant and when they wouldn't divulge the recipe, I created my own. Although a bit time consuming, everything can be prepared at least a day ahead, covered and refrigerated. I took this salad to the 2011 AR Buckeye Bash and am posting for those who requested the recipe. This salad may be served cold or at room temperature." 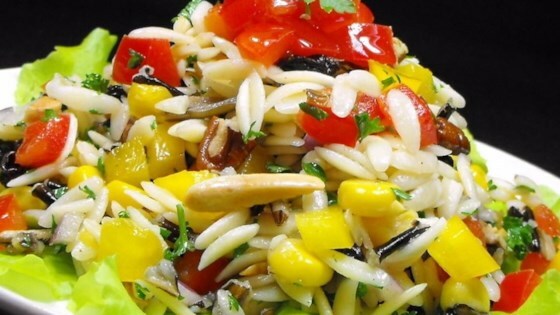 Combine orzo, wild rice, orange bell pepper, red bell pepper, corn, currants, and red onion together in a large bowl. Blend vegetable oil, sugar, white wine vinegar, cider vinegar, minced onion, white pepper, paprika, garlic powder, and 1 pinch salt together in a blender or food processor until smooth. Mix pecans, almonds, and parsley into orzo mixture. Drizzle enough dressing to coat salad; toss to evenly coat. Season with salt and black pepper. This easy salad is bright with flavor and can be a side or entrée. Good and different. I didn't use the wild rice the first time. It was too expensive for an experiment. It was good without it.